"Having worked for six years in a chemical factory at home in Italy, I decided to come to England to study English and go to university. I have long been fascinated by mechanical components and the use of alternative materials such as composites. The mechanical engineering with composites course at University of Plymouth enabled me to couple my two interests. Everything I learnt on the course has proved useful. 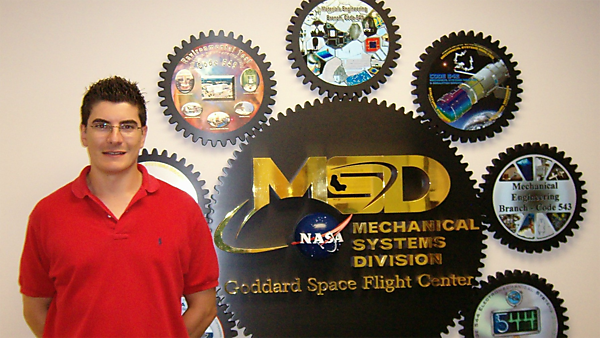 During my summer vacations I was lucky enough to secure two work placements at NASA. For the first placement I worked on X-Core, a composite material still in its early stages of study. The second placement saw me working on the characterisation of the physical properties of moon dust, apparently not worked on since the 1970s. It was an extremely exciting experience. I went to NASA unsure of myself, but left knowing I had an incredible engineering future ahead of me. After graduating I returned to Italy to begin working as a Research and Development Composites Engineer for Lamiflex. I am responsible for the development of medical components for radiology purposes. My work has included the development of a new table top for CAT scans and the development of composite components for a mammography scan device. It is very rewarding to see something that was spinning in your brain slowly becoming real and helping to improve the diagnosis of tumours."